Sat., April 14, 2018, 8:38 a.m.
JOHANNESBURG – Tens of thousands of people sang, cheered and cried as the flag-draped casket of anti-apartheid activist Winnie Madikizela-Mandela was escorted from her official funeral on Saturday, after supporters defended her complex legacy with poetry and anger. Thunder rumbled and it began to rain as the casket left the 40,000-seat stadium – a blessing, witnesses said. Heads of state joined the five-hour celebration of the powerful figure who will be buried as a national hero following lively debate over how she should be remembered after her death on April 2 at age 81. 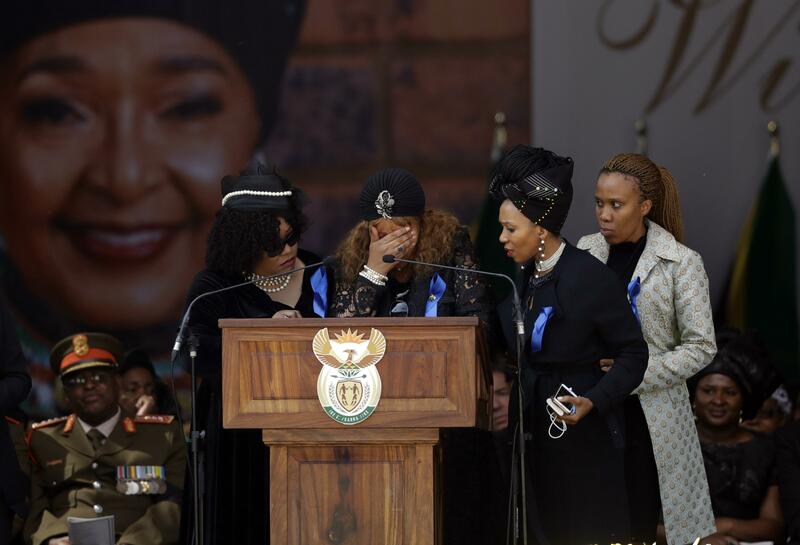 “Long before it was fashionable to call for Nelson Mandela’s release from Robben Island, it was my mother who kept his memory alive,” elder daughter Zenani Mandela-Dlamini said as the crowd erupted in cheers. Many South Africans have stood up for Madikizela-Mandela’s memory against critics who characterized her as a problematic figure who was implicated in political violence after she returned from years of banishment in a rural town. Since her death, supporters have visited Madikizela-Mandela’s family home in Soweto, the Johannesburg township where she lived, and condolences have poured in from around the world in remembrance of one of the 20th century’s most prominent political activists. Many memorializing Madikizela-Mandela recognized her as a political force in her own right. “In apartheid South Africa, the combination of patriarchy and racism together meant that black women confronted enormous obstacles from the cradle to the grave, making her own achievements all the more exceptional,” U.N. Secretary-General Antonio Guterres said Friday at a memorial in New York, not mentioning Nelson Mandela at all. The young Madikizela-Mandela grew up in what is now Eastern Cape province and came to Johannesburg as the city’s first black female social worker. Not long after, she met African National Congress activist Mandela and the couple married in 1958, forming one of the most storied unions of the century. It took a toll. When Madikizela-Mandela returned from exile she became involved with a group of young men known as the Mandela United Football Club. The men were accused of the disappearances and killings of at least 18 boys and young men and the leader was convicted of killing a 14-year-old, nicknamed “Stompie,” accused of being a police informer. In 1991, a court found Madikizela-Mandela guilty of the boy’s kidnapping and assault and sentenced her to six years in jail. She appealed and was found guilty of being an accessory in the assault, and the sentence was reduced to a fine and suspended prison term. Madikizela-Mandela denied knowledge of any killings. Though she fought fiercely for democracy, Madikizela-Mandela floundered in a political career after the first free elections in 1994. Mandela, South Africa’s first black president, fired her as one of his deputy ministers. Her stints as a lawmaker, a post she held until her death, were lackluster. Mandela-Dlamini, her elder daughter, accused the media of being complicit in a long “smear campaign” against her mother. Ramaphosa said the traumas that Madikizela-Mandela endured as a target of the powerful apartheid state inflicted “deep wounds” that never healed – and went largely ignored by many peers. Published: April 14, 2018, 8:38 a.m.